There’s two types of people in the world – the hills person and the sea person; and if you happen to be the of second type who love the expansive blue waters, the serene sound of the waves and the mystic creatures of the deep blue, Ocean Grill will surely please you. 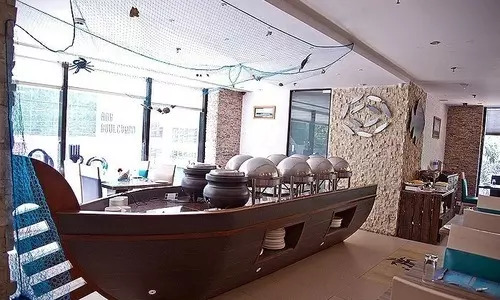 This multi cuisine restaurant in the Salt Lake with it’s oceanic decor and a very blue pleasantness, is the ideal place to enjoy a hearty meal over drinks and stories with friends. Though known for it’s buffets, Ocean Grill has got some beautiful dishes on it’s a-la-carte menu and these are all complimented by a very fine selection of drinks. Being an ocean inspired restaurant, Ocean Grill has got some amazing signature seafood dishes that one must not miss. The perfect end to a dining extravaganza here comes in the form of some gorgeous and delicate desserts, that leave a smile on your face as you walk out.